Yay spring has finally sprung! Whilst we're enjoying the slightly milder weather, it still is a long way off from summer so we've picked three scarves which aren't too heavy for the weather right now but will keep you warm at the same time! I swear this leopard print scarf has been all over Twitter today! It's sure to be a bestseller at only £15 and from Marks and Spencer - much more affordable than the Louis Vuitton leopard scarves. Coming in pink as well as blue, these are sure to add a nice pop of colour to any outfit but be quick - we're sure these will sell like hotcakes! Don't the colours in this scarf just make you feel happy? We love how bright it is and how perfect it is for spring with the abstract floral print. A bit of a splurge at £265 but it's worth it, we say! 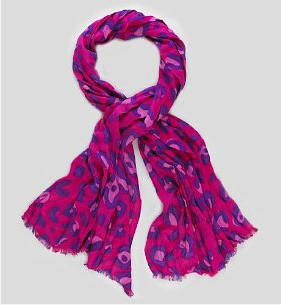 Buy this Jil Sander scarf from net-a-porter. Finally we have this tribal print Pieces Splash scarf from ASOS, £12. The tribal print is sure to take you right up until summer (including those summer rainy days!) and we think the print is easy enough palette to be worked into most wardrobes.